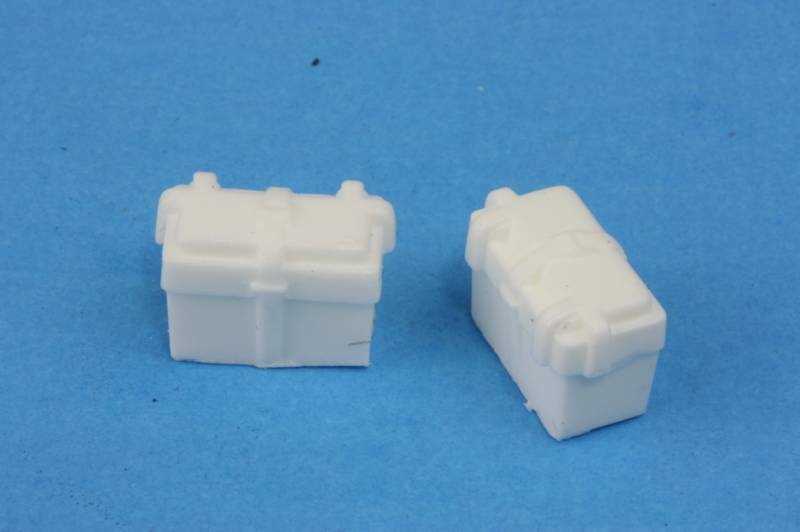 This highly accurate casting set, scaled from an actual Berkeley 12JC jet drive, will set your boat project apart from the others. 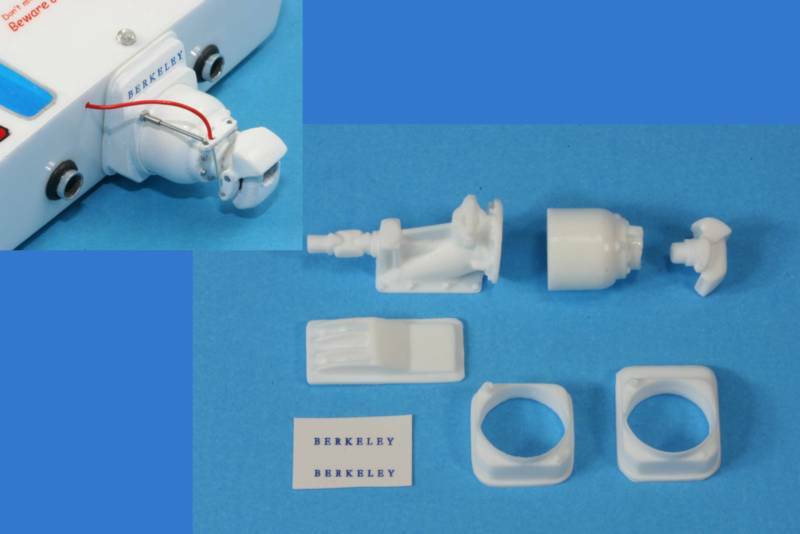 The set includes the intake grate, pump and driveshaft, pump bowl, nozzle/reverser, BERKELEY decal, and transom adapters to fit your hull. The jet drive will update the AMT Hull-Raiser. The kit includes an instruction sheet showing how to install the jet drive and detail a typical automotive V8 for marine use. 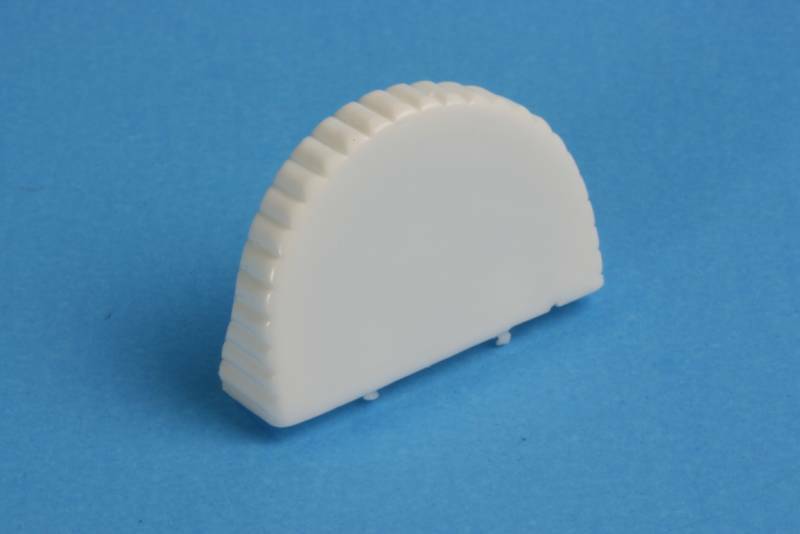 The Jet Drive Set was used on Steve's award winning "Better Idea" ski boat model (see the Gallery). Add some convincing technical detail to your boat project. This universal marine battery box looks good mounted near the engine and your jet drive. Molded in detail includes a hold down strap. Run a red wire from the box to the starter and a black ground wire to the engine block. 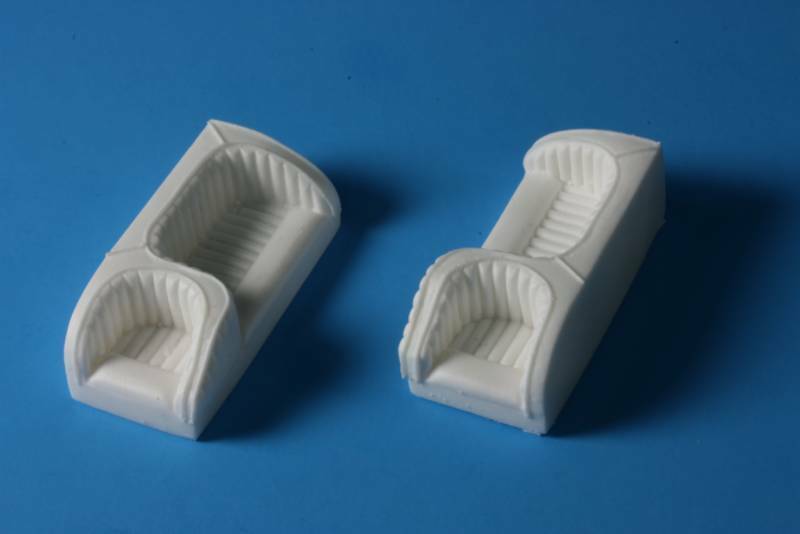 Simplify your order and save a couple of bucks on the unique Calnaga Castings you'll need to build a realistic ski boat. The set includes the Jet Drive, Seats, Engine Cover, Marine Battery Box, and a bonus Cal Custom Footsie gas pedal for the boat or your tow vehicle. The engine cover is an important part of the ski boat for appearance and safety. It separates the passenger compartment from the dangerous rotating pulleys and belt on the front of the engine. The perimeter of the cover coordinates with the nice tuck and roll upholstery on the seats and the inside has a realistic heat shield surface molded in. Actual size is 1.175" wide and 0.825" tall. Check out Steve's Better Idea ski boat in the Gallery to see how this engine cover impacts the overall look of the cockpit. The Hull Raiser is a pretty dated design with its two place seating and big center deck. Throw that stuff overboard and install these seats that allow for a driver, a spotter, and two skiers with a fore-aft walk-through. Much more realistic for later-era boats. For more information on how the masters were made for these seats, check Steve's article in the January 2011 issue of Model Cars Magazine. Plenty of material is left to adjust the seats to your hulls' rail height. The seats come in a port and starboard pair (left and right).